The area provides a ton of Charleston SC things to do such as attractions, activities, outdoor amenities and events it can be tough to narrow down your choices. Let’s prioritize. We’ve created a lineup of springtime items for your own bucket list. What’s better than that first springtime trip to the beach? Nothing beats kicking off your shoes and racing across the warm sand to dip your toes in the water. Visit one of Charleston’s area beaches for fun in the sun: Isle of Palms, Kiawah Island, Sullivan’s Island or Folly Beach. Check out our Which Charleston Beach is Best? article for more beach info. With more than 500 events across 17 days, you’re sure to find an event you love at Piccolo Spoleto. This cultural celebration highlights plenty of local talent in events all around the city – many of which are free or low cost. Events are May 27 to June 12. For an early morning stroll or an afternoon sightseeing trip, don’t miss the Battery, a seawall along the southern Charleston peninsula. Catch a glimpse of Fort Sumter and sunset views over the water. For more history, stop off at the Edmondston-Alston House, a house museum at 21 East Battery. Take a guided tour of this 1820s mansion with its collection of historic heirlooms. Watch video of why you should check out the Battery and other Charleston SC things to do! Tour Pass Charleston includes admission for over 30 top tours, attractions and historic sites and is highly rated. Includes a mobile pass with interactive maps that you simply show at the ticket counter at attractions and they check you in…no admission required. Their site also includes daily itineraries. Admire the Angel Oak, a majestic oak tree thought to be one of the oldest living things east of the Mississippi River. For centuries, the Angel Oak has grown up to 65 feet and has a canopy of branches spanning 17,000 square feet. Take one of the many available walking tours along the cobblestone streets of downtown Charleston. You’ll get plenty of history – and maybe even a little folklore – along with the opportunity to ask questions, take photos and get up and close personal with the Holy City. To take a guided walking tour check out these fine Charleston walking tour companies. Sitting stately on the Mount Pleasant side of the Charleston harbor is the USS Yorktown, the 10th aircraft carrier to serve in the U.S. Navy in the 1940s. 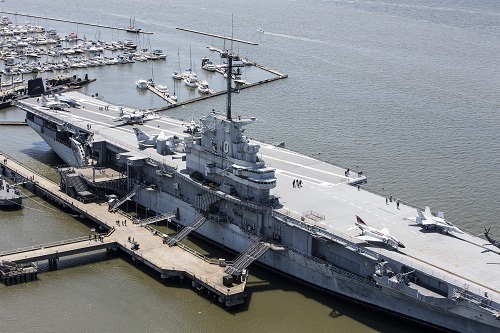 Tour the ship and take in the beautiful views of Charleston from the flight deck. Tour the Congressional Medal of Honor Museum and the Vietnam Experience Exhibit. Kick back with a cocktail and take in the Charleston skyline from one of the city’s rooftop bars, including the Rooftop Cocktail Bar at the Vendue Inn, Pavilion Bar, The Watch Rooftop Kitchen & Spirits or Stars Rooftop & Grill Room – all located in the heart of downtown Charleston. Pick a warm spring evening and watch the sunset from the bench swings at Waterfront Park (see video of Waterfront Park), one of the city’s most inviting public spaces with its fountains, pier, greenspace and amazing views of the Charleston harbor. Watch closely and you just might see some dolphins at play. Check out the Spring Festival of Homes & Gardens is one of the best things to do and see in the spring! It’s put on by Historic Charleston Foundation which runs from mid March through the end of April. Be sure to take a look at our events calendar to see what’s going on in Charleston all year long.